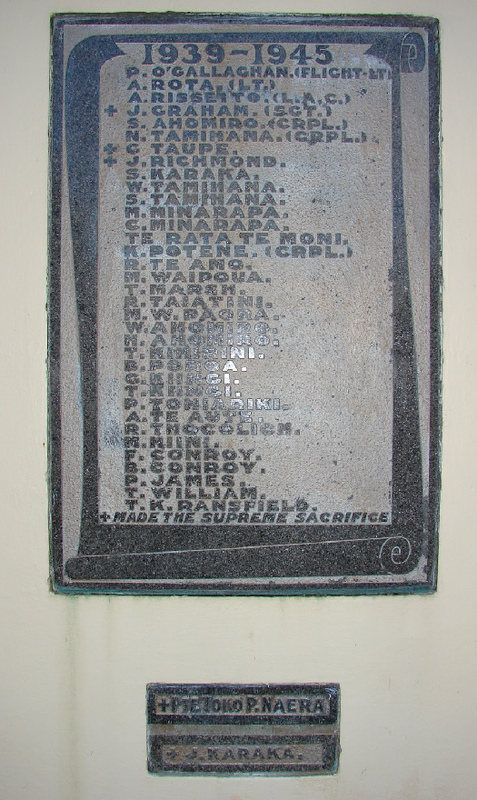 Names of men who served in WWII on the memorial at Te Matai Native School, south of Te Puke. "On 14 May 1948 the Minister of Defence F.J. Jones formally unveiled the Te Matai Native School Memorial Gates, to the south of Te Puke. Rev. Rangiaho conducted the service and read out the names of the fallen: T. Nicholls, M. Te Moni, M. Te Hui, O. Nicholls, T. Te Amo, K. Matia, Aponia Ahomiro, A. Ahomiro, A. Grey and H. Hetekia from the First World War, and J. Graham, C. Taupe, J. Richmond, Toko P. Naera and J. Karaka from the Second World War, along with the names of another 24 men who also served in the First World War and 32 who served in the Second World War. Image courtesy of Bruce Ringer, Auckland Libraries 2014.